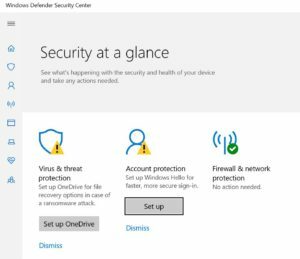 Patch Lady here – while I do appreciate Microsoft’s insistence to ensure we have multiple ways to back up our data, it does get a bit annoying when every time in 1803 that I am reminded to set up Onedrive to backup my data. I have a full drive backup and also use Azure to backup my data. When I would hit ‘dismiss’ and make the defender icon happy (get rid of the yellow ! ), it would come back the next time I rebooted my pc. I would dismiss it from the system tray and then it would be back the next reboot. Disabling onedrive in windows explorer didn’t work for me (see this zdnet post) which was my first try to disable it. I finally got rid of it was to open up settings, update and security, windows security, virus and threat protection, and dismiss the one drive THERE. Dismissing it outside in the task bar didn’t work for me. Things are looking stable. Now’s a good time to get your PC caught up with Windows and Office patches. Follow the instructions in the Computerworld article and you won’t accidentally install microcode patches, Rollup Previews and/or this week’s non-security Office patches. Microsoft converted all of the Software Development Engineers in Test (the software engineers who write automated test software) to full SDEs (Software Development Engineers). I have full confidence that the SDETs are doing well as SDEs. After all, it’s an SDE, just writing domain specific software. Same skills and what not. The former SDETs are probably the highest quality engineers on Microsoft’s team. That specialization enforces a REAL drive in you to create quality software. What I don’t have confidence in is that any developer at Microsoft is able to fully test their own software to meet deadlines without having to fudge tests and just push things through. Nor able to create maintainable automated tests on top of writing regular consumer software. Likely, deadlines are forcing them to use recording tools to make automated tests. Tool generated automated tests are extremely flaky and no where near as good as writing one by hand, as a dedicated SDET would do. As you can see, we ended up with the buggy cluster that is the current situation in Windows 10. Microsoft laid off their QA in 2012 and outsourced a very minor compliance group to VOLT. I know, because I was part of that group. When it comes to SDE/SDET at microsoft, they basically make sure builds can be built, not that they meet quality assurance standards. They have less resources to devote to testing. The problem would be that these things could be getting thrown past deadlines without receiving as much vetting as they would have had in years past. Software is buggy. Designs are imperfect. Bugs are not a chance happening but an expected occurrence. If you don’t have the proper resources to find them, your customers will suffer. You can have all the developers in the world. If you have barely anyone testing it, or barely anyone caring about proper testing because delaying a deadline would make them look bad for not delivering on time, then you’re going to have a rotten piece of Swiss cheese instead of working software. Their idea of “having people testing their software” is probably the insiders programme, which looks good on paper but really effin’ dubious when it comes to quality and workflow. It’s not only about software too. Their Surface QA is the pits. Just look at the number of hardware issues that the SP4 had and how long it took MS to even acknowledge them, and the issues that current Surfaces continue to have with the pen.